Caroline's Miscellany: How do you say Deptford? 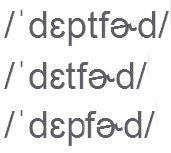 Detfud (haven't got the IPA characters) definitely, unless you replace the /t/ with a glottal stop. I'm pretty sure that pronouncing the "p" is just ignorance. And it's not the London Bridge announcer's fault if she's from Chelsea. I have grave suspicions that the 'pt' version is computer-generated without benefit of local knowledge! I would even go so far as to say it's De'fud! Detfud and Grinnich Spot on ! How do you say Millwall? I sort of leave out the "ll" more like miwall.